High Winds, Blowing Dust, Mudballs Friday. Our Next Storm Taking Shape Over California. 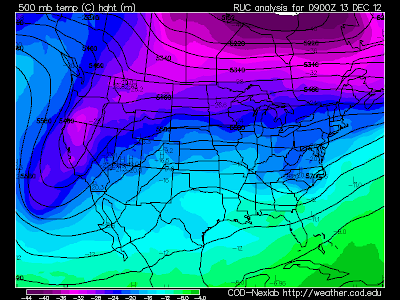 RUC 500 MB Temp Analysis At 2 AM MST This Morning. A cold (500 MB temps down to -32F/-26F) and dynamic upper level storm was centered over northern California early this morning. With the strongest winds still on the backside (west side) of this storm, it will continue digging southward today before turning east late tonight. 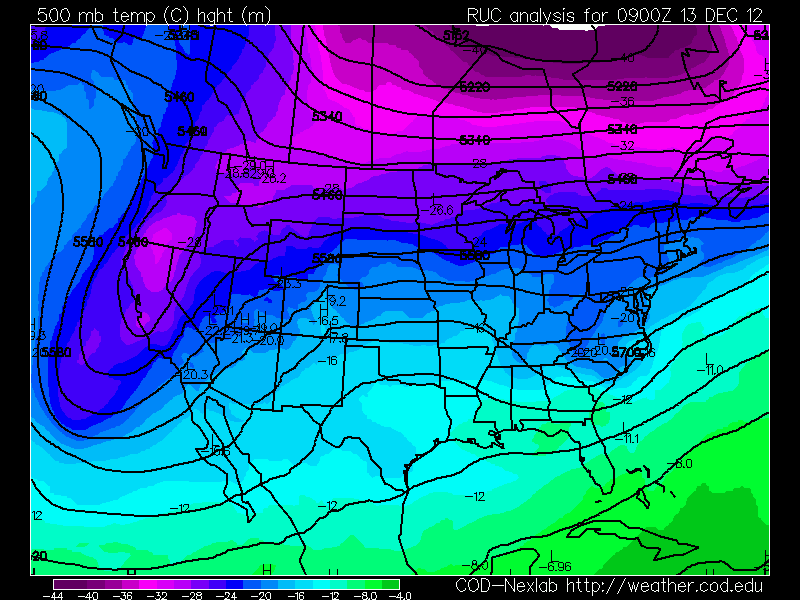 NCEP NAM 500 MB Forecast. 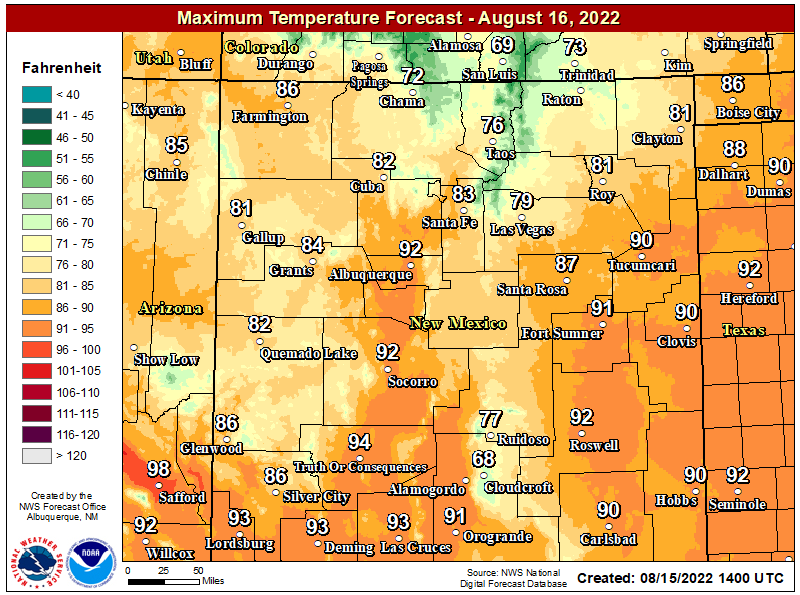 Valid At 5 PM MST This Afternoon. 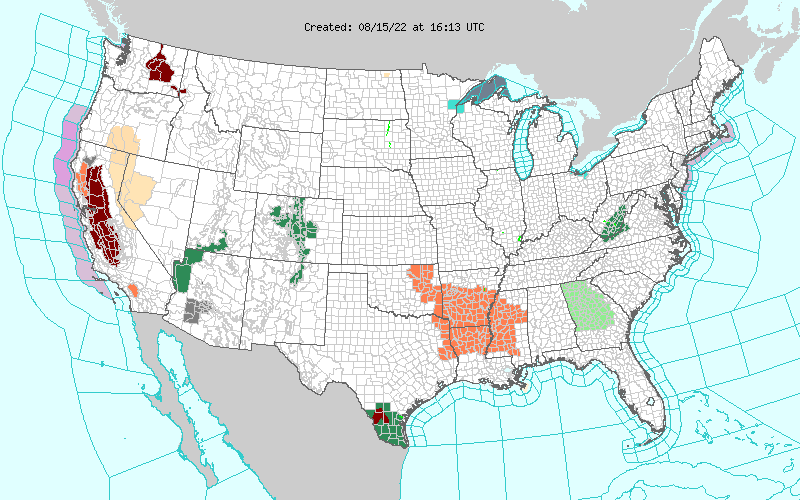 Late tonight, the strong upper level storm will bottom out over southern California, and then is expected to start moving eastward towards Arizona and New Mexico. Valid At 2 PM MST Friday December 14, 2012. 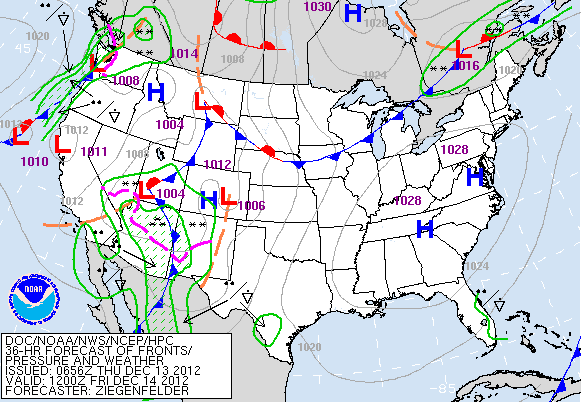 By early tomorrow afternoon the upper level storm is forecast to be located over northern New Mexico. 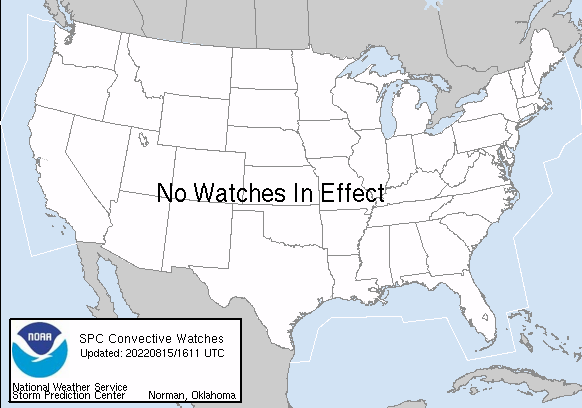 The storm will then northeastward out of the state by Friday night and Saturday. 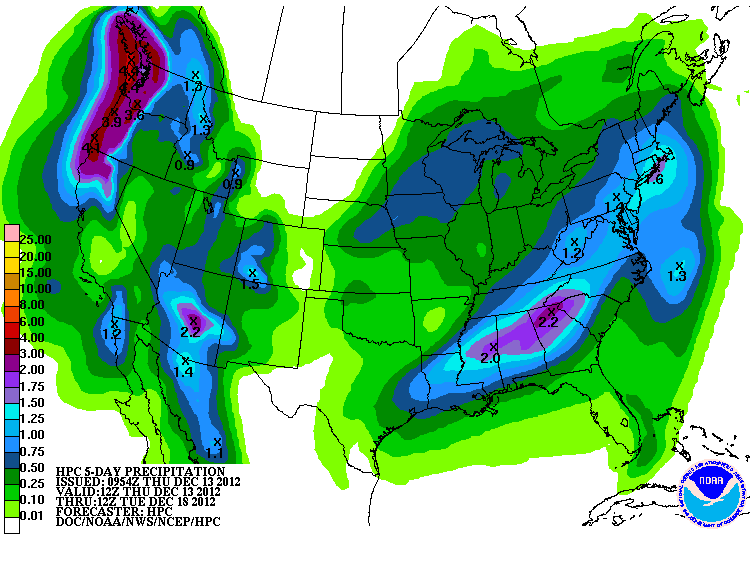 NWS HPC 5-Day Total Rainfall Forecast. 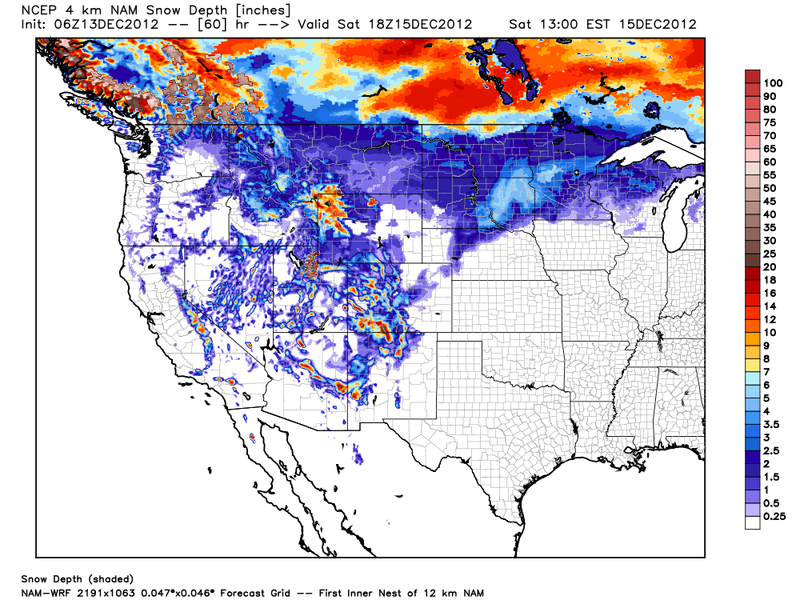 NCEP NAM Max Snow Depth. Valid At 11 AM MST Saturday December 14, 2012. 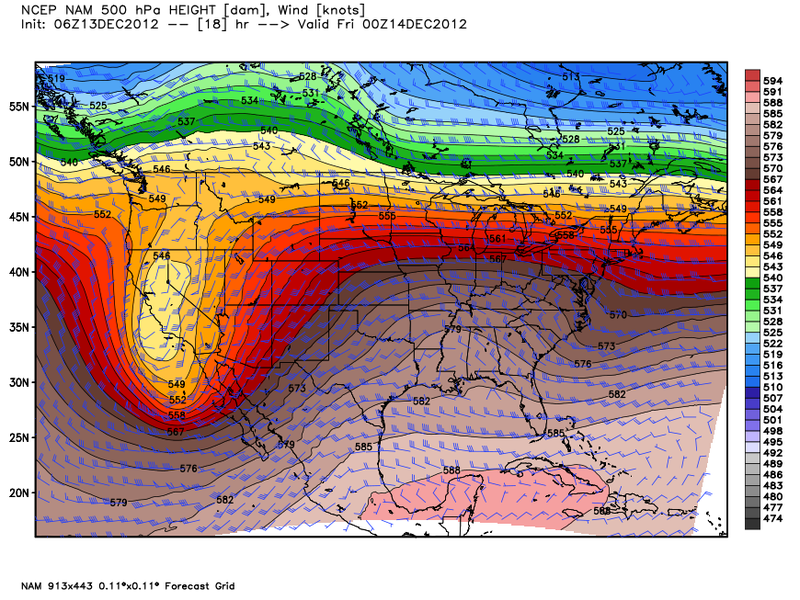 Valid At 5 AM MST Friday December 14, 2012. As the potent upper level storm moves into New Mexico late tonight into Friday, old man winter will roar. 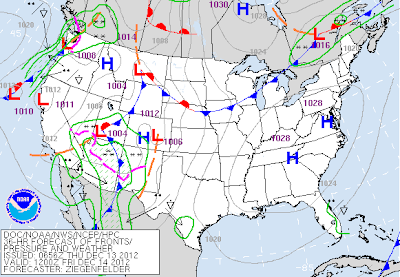 A strong Pacific cold front will accompany the upper level storm. 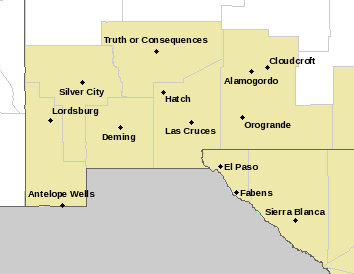 Winter Storm Warnings, Winter Storm Watches, and Winter Weather Advisories cover much of western and northern New Mexico. The higher mountains of these areas of the state could see upwards of a foot of new snow out of this storm. Some parts of the lower elevations of southwestern New Mexico may received up to .50" to 1.00" of rain from this storm. A Winter Weather Advisory is now in effect for Lincoln County for snow and blowing snow, beginning at midnight tonight, and continuing into midnight Friday night. Elevations below 7,500' are forecast to receive 1" - 3" of new snow, while elevations above 7,500' are expecting to receive 2" - 5" of new snow. 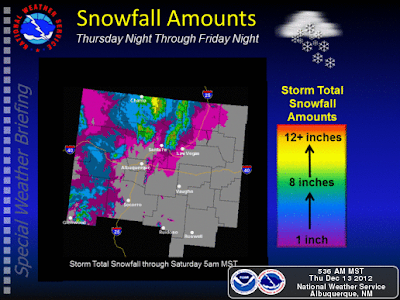 Ski Apache may easily see at least 8" of new snow from this storm. Although no advisories (as of 6 AM MST this morning) are currently in effect for the southern Sacramento Mountains, Cloudcroft and nearby communities above 6,000' may end up with 3" - 5" of new snow from this storm. 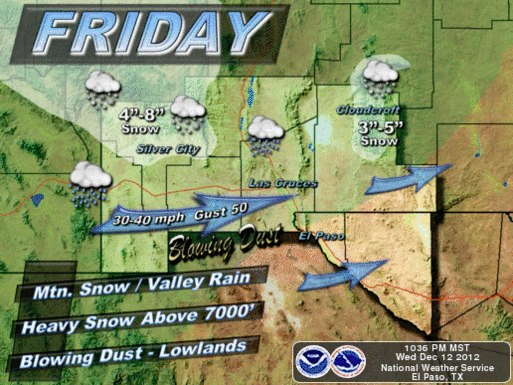 High Winds & Blowing Dust For SE NM Friday. 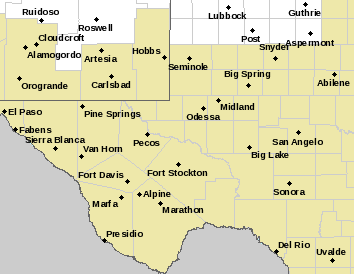 Midland NWS Outlook For Friday. With the center of the upper level storm forecast to swing across northern New Mexico Friday afternoon and evening, this can only mean one thing for southeastern New Mexico, lots of wind! 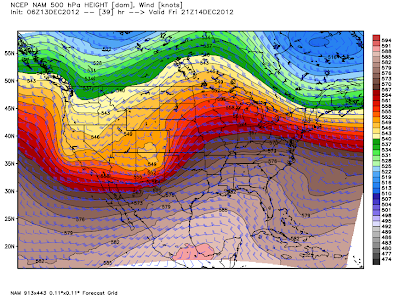 Very strong winds aloft (70 mph at the mountain top levels - 10,000') are forecast to mix down to the surface on Friday, as the surface pressure gradient tightens up ahead of the approaching upper level storm and the Pacific cold front. 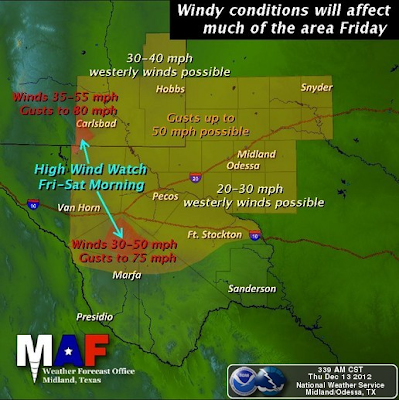 A High Wind Watch is in effect for the Guadalupe Mountains from Friday morning through Friday night. 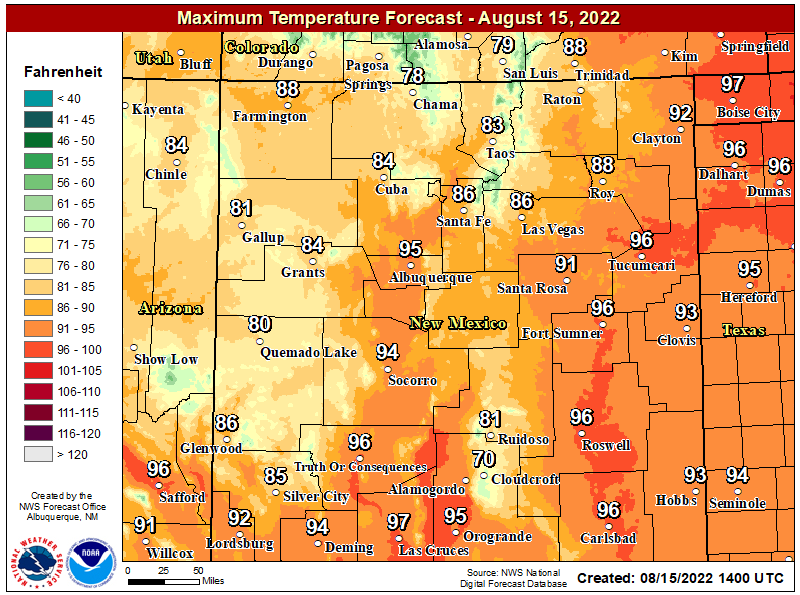 Westerly winds are forecast to increase to sustained speeds of 35 - 55 mph with gusts near 80 mph. 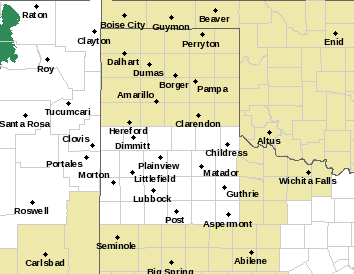 Blowing dust may also become a problem with visibilities dropping down below one mile. Southwesterly-westerly winds are forecast to increase to sustained speeds of 30 - 40 mph with gusts near 50 mph across the southeastern plains of New Mexico on Friday. 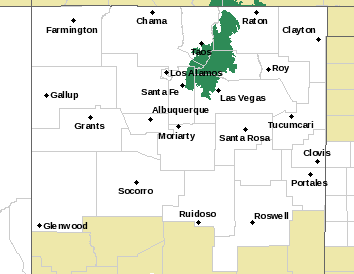 Some higher gusts will be possible in the more wind prone areas such as over and near the foothills and mountains. Blowing dust may suddenly reduce the visibility down to near zero with little or no advanced warning. This will be especially true over and near freshly plowed or exposed farmlands, open lots, fields, and construction sites. Please use extra caution if you must be traveling upon our local roadways on Friday. A few light rain showers may also be scattered around the area on Friday. Mix a little rain in with the blowing dust and you have flying mud balls, sounds like fun right? 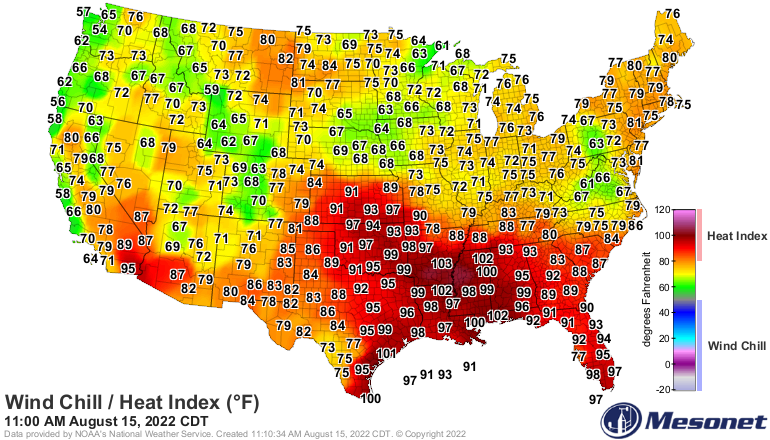 Its even possible to hear a clap or two of thunder Friday afternoon. Our chances for measurable rain are only around 20%, so we are not expecting to see much out of this storm at this time. 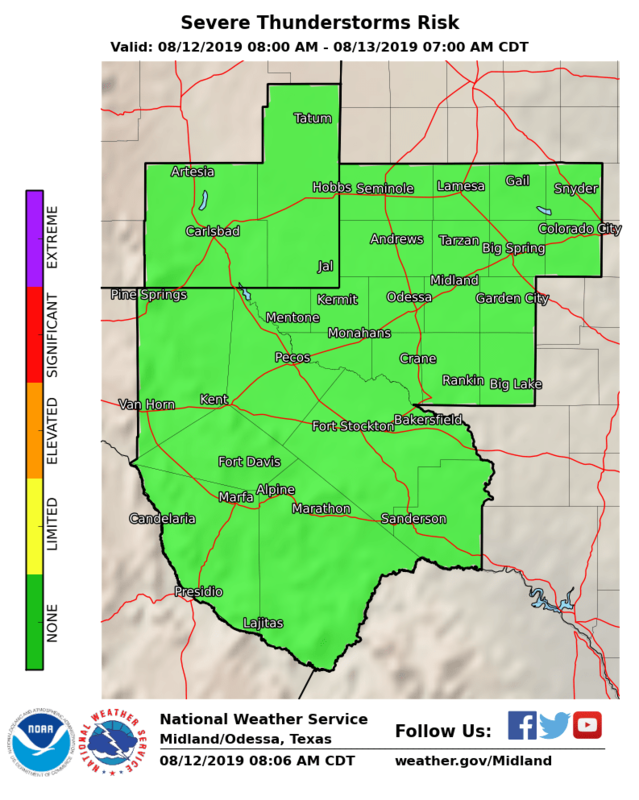 A rain/snow mix will also be possible over the Guadalupe Mountains but no significant accumulations of snow are currently being forecast. A cooler airmass will overspread the local area behind the Pacific cold front Friday night into the weekend. 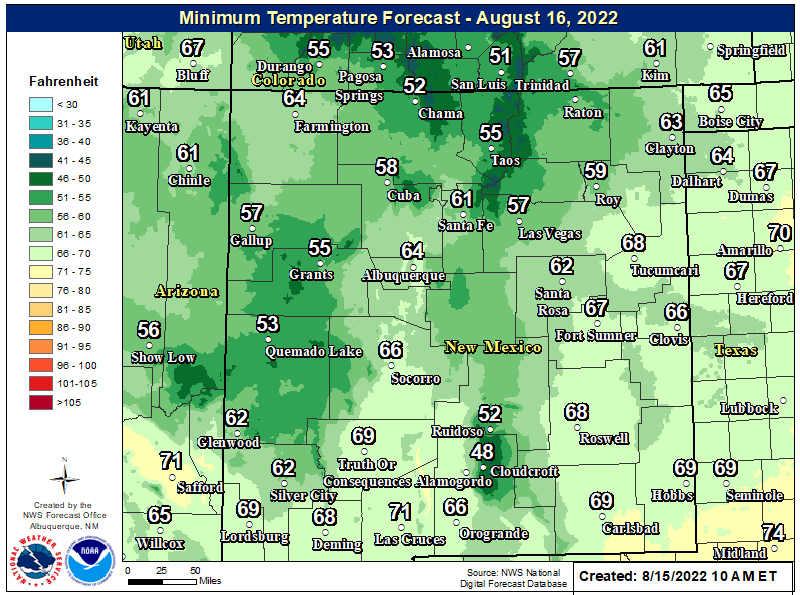 Our highs today are forecast to be in the mid 60's, the upper 50's to the mid 60's on Friday, the upper 50's to the low 60's on Saturday, and the upper 50's to near 60 on Sunday.